A quiet holiday week closes out the volatile 2011. After making a new uptrend high at SPX 1269 on tuesday, the market declined to 1249 on wednesday. And that, was the entire range for the week. For the week the SPX/DOW were -0.60%, and the NDX/NAZ were -0.45%. Asian markets lost 1.1%, European markets were +0.8%, and the DJ World index was -0.1%. On the economic front reports were mainly to the downside. On the uptick: Consumer confidence and the WLEI. On the downtick: Case-Shiller, Pending home sales, the Chicago PMI, the Monetary base, and weekly Jobless claims increased. During the year the SPX traded between 1371 and 1075 ending with a net loss of 0.04 points. Trading for 2012 starts on tuesday with a full economic plate for the week. Highlights include the FOMC minutes, ISM, and the monthly Payrolls report. Happy New Year! After completing a 26 month, (Mar09-May11), Primary wave I high at SPX 1371 the market declined in five waves to 1075 by Oct11. We initially interpreted this decline as five waves down completing Major wave A. Then we expected a Major wave B rally, lasting about two months, retracing about 61.8% of the entire decline: around SPX 1258. The market then surprised most with an impulsive looking uptrend to SPX 1293 in only 18 trading days. We then considered the five waves down might have been an extended flat. Similar to the extended flat that ended the 1987 crash. This opened options to both a bull and bear market scenario. After the late-October SPX 1293 high, the market corrected in an abc pattern into a late-November low at SPX 1159. This corrective downtrend, essentially, kept both bull and bear scenarios alive: a resumption of the bull market, or a Major wave B still underway. For most of 2011 nearly every trend, (wave), has lasted only one month. The market has displayed five waves down from May to October, five months. Now, three waves up from early October into the end of December. January would make it three months. This is not typical bull market activity. Bull market uptrends usually last two months or longer, with downtrends about one to two months. During Primary wave I, for example, all uptrends lasted between two and seven months, while the downtrends were one to three months. Should the current uptrend extend into February this would be quite bullish long term. If the uptrend has already topped, or tops soon, bear market characteristics continue. In the past 25 years the market has displayed three five wave down patterns after an important top: 1987, 2008, and 2011. In 1987, the five wave decline ended the, 36% market loss, bear market with an extended flat, and the 1987-2000 bull market was then underway. In 2008, the five wave decline ended only wave A of that ABC, 58% market loss, bear market. 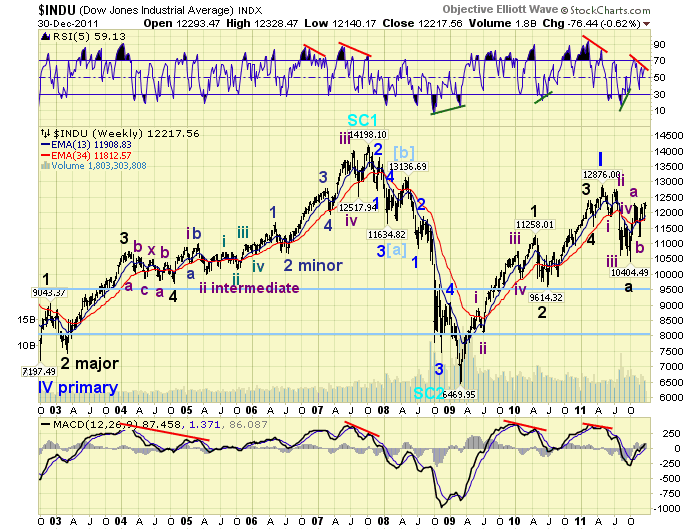 The end result of the current 2011 five wave decline, market loss 22%, is still undecided. While the patterns of all three declines look similar, there are some relative strength differences. In 1987 three of the four major indices outperformed the SPX into its final December low. A new bull market resulted. In 2008 all four major indices underperformed into the March low. A two month B wave rally followed before a nasty ten month decline into the bear market low in March 2009. In 2011 the only index to outperform, three of the four majors, into the October lows was the NDX. A two month rally, thus far, has followed. While current relative strength, and other technicals, look better than the 2008 five wave decline. They do not look as good, as they did after the five wave bear market ending 1987 decline. This analysis suggests the five waves down was a Major A, and the current three waves up are a Major B, in an ongoing ABC bear market. 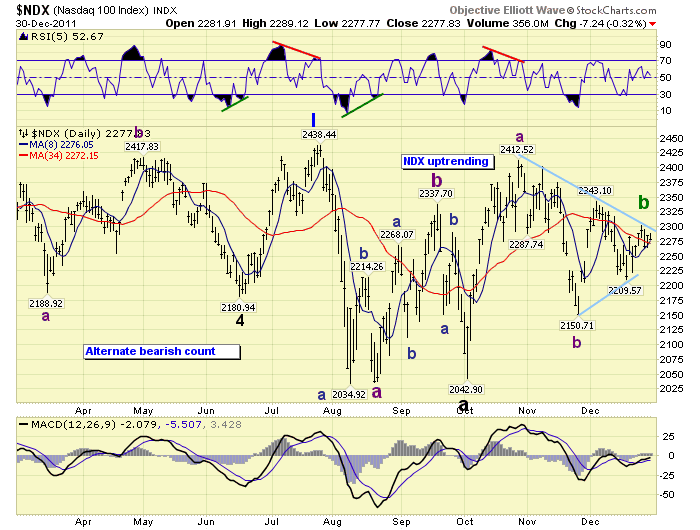 The technicals we have been tracking are still displaying B wave chartacteristics after nearly a three month rally. The monthly RSI has still not cleared the neutral line, and the MACD is on a negatively cross. 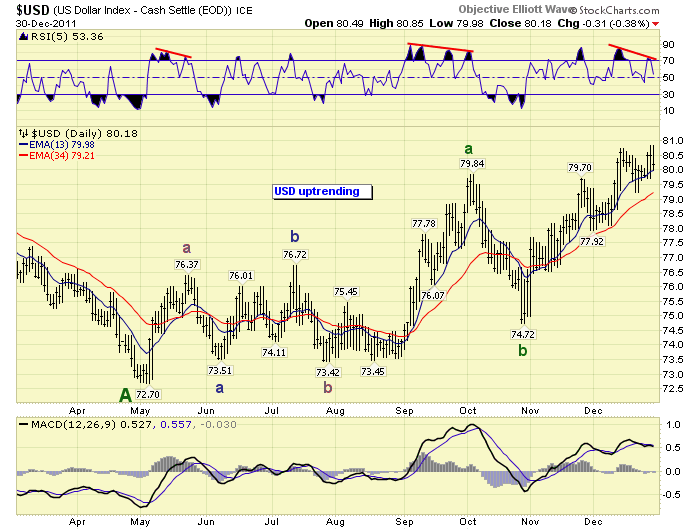 The weekly RSI did not get into an extreme overbought condition, and the MACD is hovering around neutral. Corporate bond risk, while more subdued than 2008, is still rising. The rise in the NYSE percentage of stocks above their 200 dma still looks like a B wave response from an oversold condition. And, our smart money indicator has improved but remains mixed. If the bull market is resuming it needs to reassert itself soon. The uptrend from the post-Thanksgiving day low at SPX 1159 was first confirmed by the DOW. Then the other three major indices followed. Unlike the first uptrend off the early-October SPX 1075 low, when all four indices rallied together, this uptrend displays a fragmented advance with three distinct and separate patterns. These patterns are best illustrated by the DOW, SPX and NDX. The DOW is the only index, of the four majors, to make a higher uptrend high than the late-October uptrend high. This chart displays a classic ABC retracement rally after a Major A five waves down pattern. The retracement was quite strong, 78%, which bodes well should the bear market resume. The new high in the DOW uptrend has coincided with a negative daily RSI divergence, and it occurred around a holiday. Negative divergences at uptrend highs often signal weakness, and trends often reverse around holidays. The SPX displays a weaker pattern during the current uptrend. Thus far, it has failed to reach the late-October SPX 1293 high by about 2%. This could be counted as a failed Intermediate wave C in a Major B wave bear market counter-trend rally. The retracement level at SPX 1293 was 73%. But if the potential Major B ended at SPX 1269 the retracement level falls to a more acceptable 66%, closer to the customary 61.8% level. The SPX is also displaying a negative RSI divergence. The NDX displayed quite a bit of relative strength during the SPX/DOW five wave decline: May-Oct. The NDX made a new bull market high in July. It also displayed relative strength at the early-October low by failing to make a lower low. After it led all four major indices higher in October, retracing nearly all of its July-Aug decline, it has weakened dramatically during the current uptrend. The pattern it displays since the October low appears to be a contracting triangle. Triangles can occur in B wave counter-trend rallies during large corrections and bear markets. Should the bear market resume shortly this would be the count. 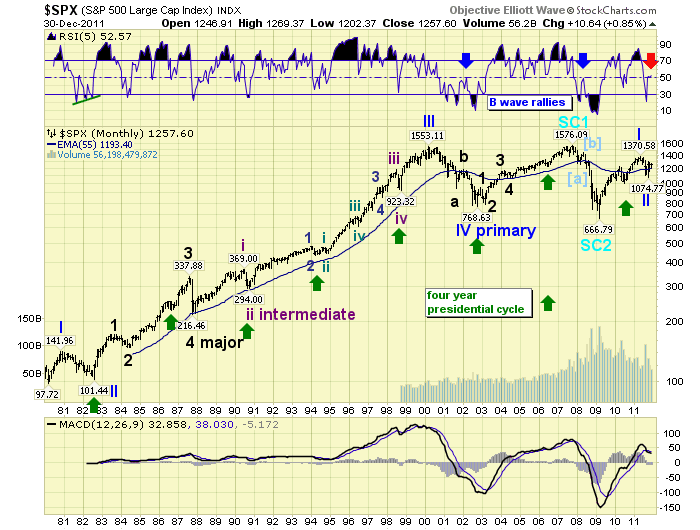 The bullish pattern posted on the SPX charts displays a Primary wave I in May at SPX 1371. This is followed by an extended flat Primary wave II decline to SPX 1075 in early-October. 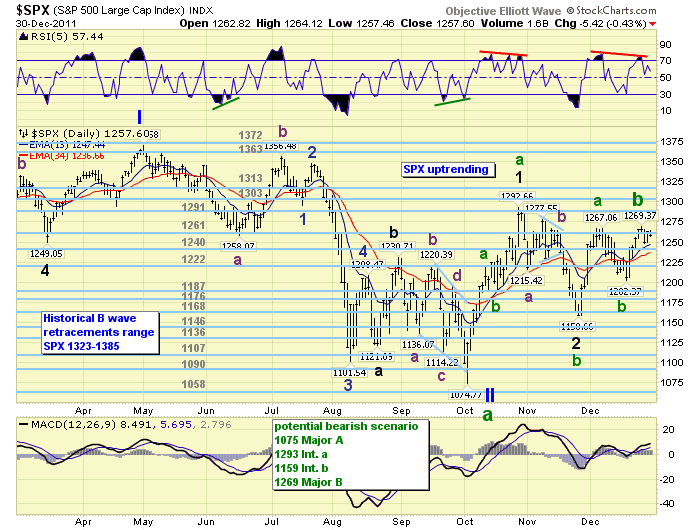 Since then the market has rallied, impulsively, to a Major wave 1 high in late-October at SPX 1293. 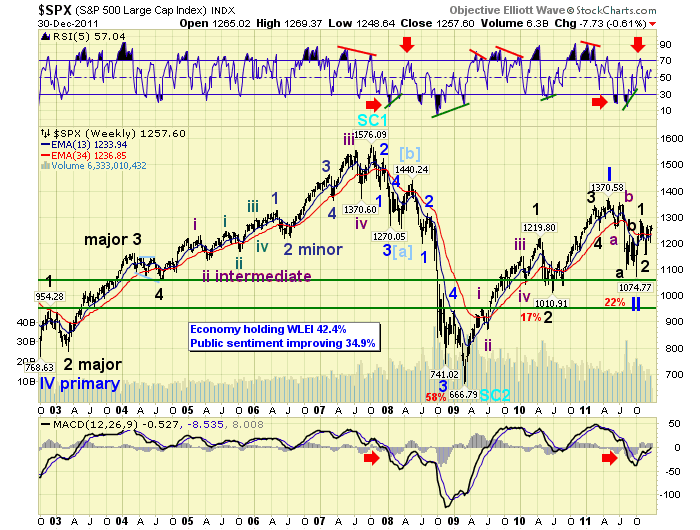 Corrected to late-November in a Major wave 2 at SPX 1159. Then, started a Major wave 3. Since we expected some heavy overhead resistance initially during Major wave 3, we suggested the current uptrend would only be Intermediate wave i. With this in mind we counted the early-December rally to SPX 1267 as Minor wave 1, and the decline into mid month to SPX 1202 as Minor wave 2. Minor wave 3 would be underway now. 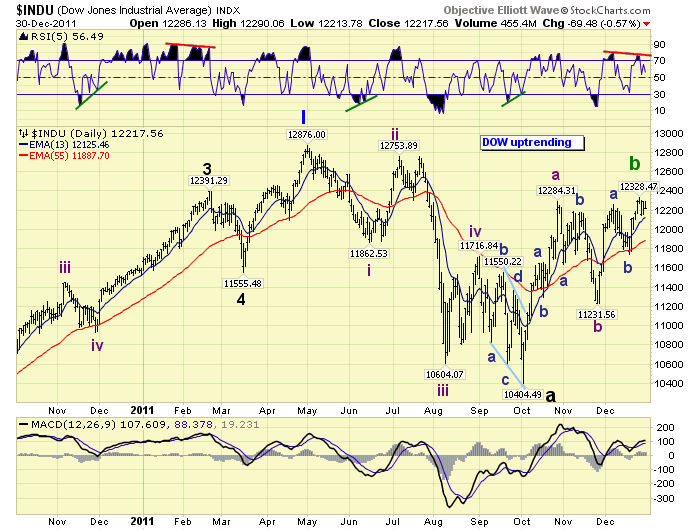 Thus far this market is not displaying any signs of a strong third wave. The first few weeks of January will be crucial for this potential bullish scenario. This count is displayed quite clearly on the chart below. Support for the SPX is at the OEW 1240 and then 1222 pivots, with resistance at the 1261 and 1291 pivots. Short term momentum is slightly oversold. During the 3+ week October uptrend the SPX ran into resistance at the OEW 1261 pivot, had one of its largest pullbacks, then broke through it to the 1291 pivot ending the uptrend. After that there was a sharp pullback to SPX 1215, then a rally back to the 1261 pivot. After a couple of weeks of vacillation, above and below this pivot, the market broke down into a confirmed downtrend. During the current uptrend the SPX again ran into resistance at the 1261 pivot. Then gradually sold off, over two weeks, to SPX 1202 before attempting again to break through this pivot. Why is this pivot so important? 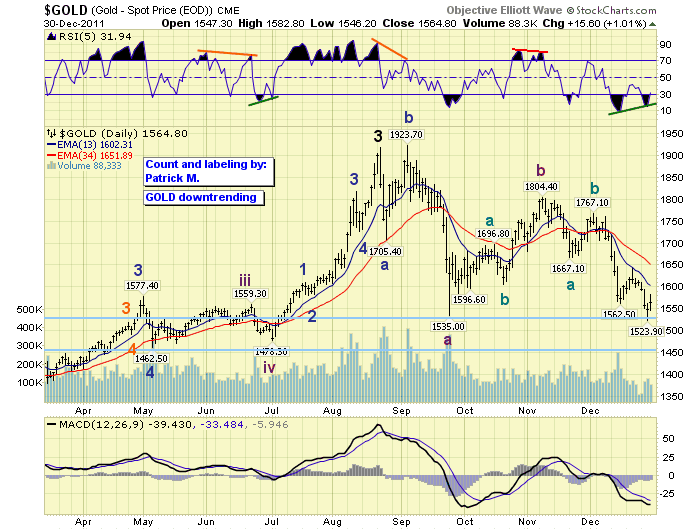 It represents a 61.8% retracement of the entire five wave May-Oct decline. And, it represents where the first wave of that decline ended: SPX 1258. When the SPX rallied above this level in October it confirmed that entire May-Oct decline was a completed five wave pattern. Unfortunately this does not confirm the correction/bear market is over, only the completed pattern. Until the SPX can break solidly through this pivot, and then use it as support, the overall trend is down. 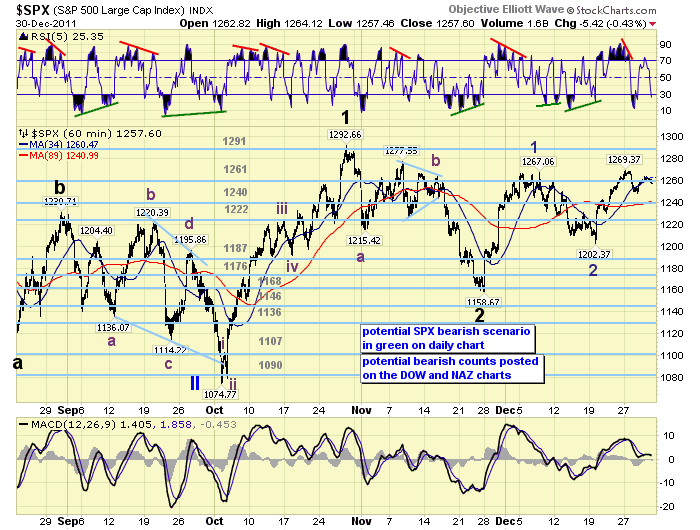 Short term OEW charts remain positive as long as SPX 1250 holds support. Short term support is around SPX 1249/50, the OEW 1240 pivot, and around SPX 1230/31. Overhead resistance is at the 1261 pivot, SPX 1278, and then the 1291 pivot. Best to your trading in 2012. Happy New year! The Asian markets were mostly lower on the week for a net loss of 1.1%. The European markets were all higher on the week for a net gain of 0.8%. The Commodity equity group were mostly lower for a net loss of 0.9%. The DJ World index lost 0.1%. Bond prices (+1.0%) continue to drift higher in an uptrend as 10YR yields decline. The 30YR is again under 3.0%, and we expect the October 2008 2.52% yield to be reached, and exceeded, before the Bond bull market ends. Crude (-0.6%) confirmed a downtrend after the $103 high in November. Initial support is at $95, $93, and then $89. Gold (-2.8%) remains in a downtrend with signs of a potential bottom. This week Gold exceeded the September $1535 low with a lower low at $1524. It displays a positive divergence on the daily charts, and hit the $1463-$1535 support zone we had been anticipating. Silver hit $26, this week, for the third time this year: Jan, Sept. and Dec. Then bounced off that support. The USD (+0.3%) continues to uptrend, but is currently displaying a negative divergence at this weeks highs. Just as it did in October before a large pullback. The EUR (-0.7%) is displaying a positive divergence, just like October as well. Monday is a holiday. Tuesday kicks off the economic week with ISM manufacturing and Construction spending at 10:00, then the FOMC minutes at 2:00. Wednesday we have Factory orders and monthly Auto sales. Thursday, weekly Jobless claims, the ADP index, and ISM services. Then on friday the monthly Payrolls report and Unemployment rate. The FED re-awakens on friday with two scheduled speeches. FED governor Duke will deliver a speech around 12:30 in VA, then FED governor Raskin speaks in MD at 1:00. On saturday, FED governor Raskin gives another speech in Wash, DC at 12:30. All the best, to you and yours, in 2012!